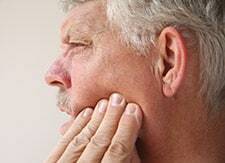 Many patients clench or grind their teeth due to stress and many times it occurs at night while sleeping. This can be noticed by the patient waking up with headaches or with teeth that show signs of wear. For this, an occlusal night guard can be made. An impression will be taken of the patient’s teeth and a hard splint will be made to wear on the top teeth. The occlusal guard will keep the teeth from wearing and will keep the jaw in a stable position through clenching/grinding.